Key companies of lighting industry, such as Osram, Philips, Panasonic, and GE Lighting, occupies approximately 70% of total lighting market and maintains stable entry barrier. Most of the key companies are also actively carrying out OLED lighting development as next generation lighting. As they reveal new OLED lighting panels each year, it is estimated that these companies will play a major role in next generation lighting market. However, once OLED lighting market is vitalized, the existing lighting companies’ stable market control is expected to be rattled. 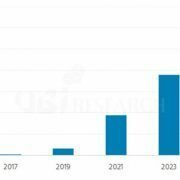 OLED Lighting Annual Report, published by UBI Research, pointed out that major lighting companies have already invested in LED lighting in large scale, and estimated until the investment cost is returned new investment for OLED lighting will be difficult. To stimulate OLED lighting market the report suggested push market, a strategy being used in display market. According to the report, the production cost competitiveness can be achieved through aggressive investment by LG Chem. and new OLED lighting companies such as Lumiotec. The report also estimated once OLED lighting market is open through aggressive investment and push market strategy, the lighting market leadership will be transferred to new OLED lighting companies which invested in OLED lighting early from major companies which missed investment timing. OLED lighting market is currently being formed through specialized uses such as for interior/outdoor design, shop, restaurant, medical, and cosmetic. Konica Minolta has already completed mass production line investment and the line has been in operation since the end of 2014. LG Chem. is also positively considering mass production line investment. When OLED lighting panel’s active mass production begins, the market is forecast to expand as specialized lighting and replacement lighting for incandescent and fluorescent lights. From 2020, when OLED lighting panel is estimated to achieve reasonable price as interior lighting through major panel companies’ active mass production, it is estimated it will grow by encroaching part of LED lighting market. From 2017 OLED lighting panel market for interior lighting is forecast to grow rapidly at CAGR of approximately 90%, and record US$ 5,700 million revenue in 2025. Flexible OLED lighting panel is estimated to be used where normal lighting application is difficult and occupy approximately 27% of OLED interior lighting market in 2025. [Lighting Japan 2015]What is the keyword for the next lighting industry? 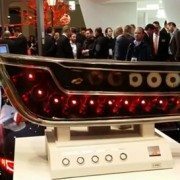 LG Chem.’s OLED Lighting Business Toward LGD. What is the Future Direction? What is the Next Key Technology in OLED Display? Chinese Panel Company, Reborn as Center of Mobile Device Display Market?